You would be forgiven to think that someone who has published eight books on Kindle would know all that there was about publishing and Amazon’s KDP platform. Well let me disavow you of that notion. Sure I know how to write a book, format it and upload it for sure but when it comes to book promotion, I confess that I pretty much make it up as I go along – I am still learning. Now I had pretty good initial success with my latest book, This We Know. A month after I wrote and published it (incidentally which took less than a month), the book got over 30 reviews [UK & US] and not a bad ranking in the charts in its genre. Since then, like many books, it’s been sliding down into the Amazon noise floor. Like many authors, I was getting despondent and wondering what to do and what I was doing wrong. Then out of the blue, I had an email inviting me to look at Udemy. Less than a month later, I had uploaded three of my own courses – see here … but then a real bonus came in. Not only does it cover everything you need to know about formatting your book, which is great if you haven’t done it before, but there’s a whole load of really useful information for “old hands” like me on selling and promotion. I’ve only implemented a couple of the tips this weekend and already sales have started to come in again – eternal thanks Cathy. 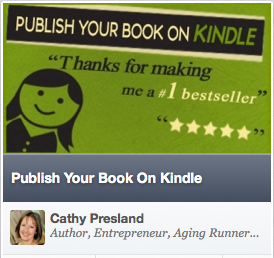 I love too the way you share success stories of your students – you are a god send to all authors. So whether you are a new author starting out or an existing author, this course should be high on your list of investments this year. p.s. I am only recommending this course because I purchased it myself. p.p.s. This is an affiliate link so there is a revenue share for me if you decide to purchase it too. I am pointing this out because if you like the course, as much as I did, you can do just the same.